Fresh from defending her pack in battle, Natalya Stravinsky, a whip-smart werewolf with a lovable neurotic streak, wants a little rest and relaxation. Once an outcast, she’s now eager to rejoin the ranks of her New Jersey pack, and has even gotten a handle on her obsessive urge to hoard holiday ornaments. Yet Nat barely has time to revel in her progress before the next crisis comes howling at her door. Nat’s father has suddenly gone missing, captured by the Russian werewolf mafia. And as Nat steps up to save her dad from a mob boss’s deadly game, two men step in to play another round for her heart: her gorgeous alpha ex-boyfriend, Thorn, and her new flame, the sweetly sensitive wizard Nick. With her life growing more harried by the minute, Nat must stay cool, calm, and collected . . . or else risk losing everything. 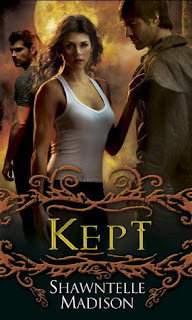 Kept continues the Coveted Series, following low ranking werewolf Natalya Stravinsky as she works to control her compulsive need to collect holiday trinkets. After the threat to the New Jersey pack has been resolved, Nat is vying to get her position back in the pack. Between her father going missing and Nat's taking it upon herself to fulfill his debts, there's not much time left for her to train for the pack's trials. Shawntelle Madison takes readers for a wild spin in this novel and surprises all with it's finishing touch! Nat is a stronger character as she takes on responsibility in the midst of her own personal turmoils. While she has the looming trials over her head, she still has to deal with the pain of seeing her ex-boyfriend Thorn, who is also the future Alpha, with his intended, a mean-spirited and high ranking wolf. At times it seems as though Thorn would rather be back with Nat than doing his duty to the pack. Even though the wizard, and fellow collecting-buddy, Nick is a contender for Nat's heart I don't think what is supposed to be a love-triangle is explored enough. Nat and Nick have a wonderful connection and are really sweet together, but it was obvious that her passion was reserved for only Thorn. Nick is more like a minor distraction than a serious player in the game for a relationship with Natalya. The romance is sometimes just okay and at very specific times sensual and passionate, but the action is absolutely the star of the plot. When Nat takes on the Russian werewolf mafia the story builds in tension and mystery. Her journey is dangerous and unpredictable, even if she brings along a few friends to help with her task. When the story gets to the much awaited pack trials readers will be head over heels with anxiety, wondering if Nat will come out on top, or even alive. The conclusion of Kept is what really brings me to really love and cherish this series. Natalya is a very determined wolf that surprises time after time and ultimately inspires one to believe in hope. I can't imagine what future trials might befall Nat, but I have a strong feeling that she won't be facing them alone! Visit the COVETED Series Website!